Work is underway for the installation of a new outdoor ice rink for the winter season. It is located in the main square of Samokov town, which is 10 km from Borovets. Winter here is the perfect climate for enjoying such an activity. No doubt it will be welcomed by both locals and tourists alike. Last week it was announced that Sofia airport has been granted a 3A category landing system. This means that planes can land with visibility as low as 200 meters, which would significantly reduce delayed or cancelled flights in foggy conditions. 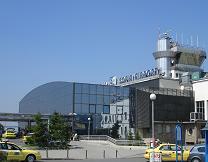 It is the first airport in Bulgaria to get this upgraded category. According to preliminary data recently released by the head of Bulgaria's State Tourism Agency, over 4.3 million foreign tourists visited the country between January and August 2008, which is a 15% increase compared to the same period in 2007. There is a wonderful array of autumnal colours on the trees in Borovets at the moment. There is a little chill in the air now but still plenty of sunshine to be enjoyed. The mountain peaks have had their first sprinkling of snow and there was even a light fall of snow in Borovets...only for one day though! It was during a short cold spell and melted as soon as the sun shone through. The builders enjoyed a celebration two weeks ago when the construction of the first roof was completed on chalets 5 and 6. It is traditional here in Bulgaria to put the Bulgarian flag on the first roof of the complex and to clap and cheer for the occasion. As you can see below the external and internal brick work is continuing on the chalets. The apartment building is now at the third floor level and the builders are preparing the shuttering for the supporting columns of the fourth floor. The first of the brick work has been started on the lower levels of the apartment building. Also the thermal & hydro insulation work on the apartment building has commenced. One of the many services we provide at Concept Bulgaria is rental management for our clients. We understand that for many Bulgarian property investments the rental management is critical to the success of your investment. Marketing is obviously key to maximising the return on your investment. There are many ways to promote your property for rental and we are committed to using numerous methods for this. One of which is a website that we are currently developing which will provide information about Chamkoria Chalets, detail the properties for rent, outline the facilities and services available, and will also allow customers book directly through it. This is only one of the ways we will market your property but it is an important one. The launch of this website will be before the end of 2008 and as soon as it is available you will be the first to know. We will provide a full marketing and management package for your chalet or apartment. For this service we charge a percentage of the gross rental. The system is operated by means of a rental pool where all owners renting through this option will have a share in the rental returns. You would still be able to use the property yourself or give it to friends but you must give us adequate notice of the period when you would like to use the property. In this scenario your property would of course not be part of the rental pool for the weeks that you are using it personally. With this package you can be totally hands-off and do not need to get involved in the rental of your property. Some of the services included in this package are airport transfers, meet & greet, welcome packs, cleaning, maid service, laundry, key holding, and ski hire. We understand that some buyers will prefer to market their property themselves and receive the rental income directly. To assist with this we will provide a range of client services, including the ones mentioned above, that will allow you to provide a relaxing holiday experience for you clients.